Gemstones are more popular than ever. While it’s common for people to buy their birthstone – you don’t have to! The key is to just buy what you like. Like all of our inventory, our gemstones are all hand-picked and quality assured. Don’t be surprised when people start staring at your gemstones from Mitchum Jewelers. Learn more about gemstones at the Gemological Institute of America. 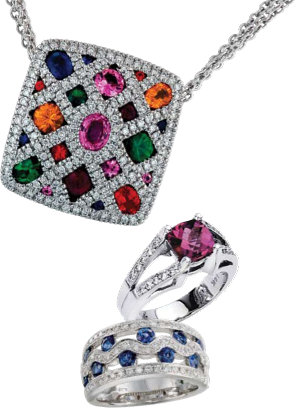 For those who want to incorporate something vibrant into any outfit, gemstone jewelry is a phenomenal choice. Whether you find yourself drawn to vivid reds, deep blues, or lush greens, you can be certain to find a unique piece that speaks to you. We personally select each piece based on its degree of color and quality. Add a little color to your wardrobe!